Frisia Occidentalis Auctoribus Adriano Metio et Gerardo Freitag - HONDIUS, J. Title : Frisia Occidentalis Auctoribus Adriano Metio et Gerardo Freitag. Size : 15.4 x 19.7 inches. / 39.0 x 50.0 cm. 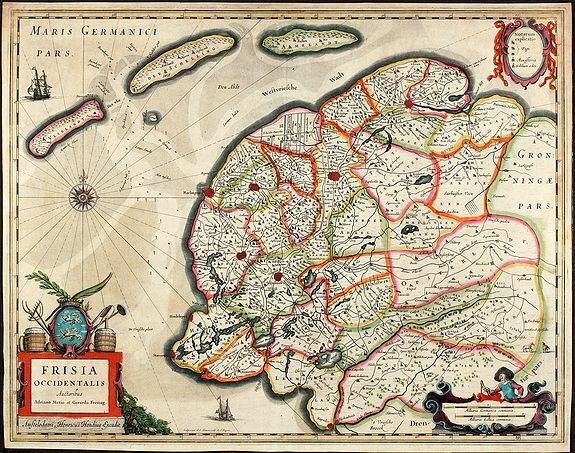 Description :Original old coloured map of West Friesland with the islands Vlieland, Terschelling und Ameland. With 3 cartouches, two sailing ships and a compass rose. Published by H. Hondius after Adrian Metius und Gerard Freitag around 1630, without text on verso. Condition : Remargined on top, slighly browning, good conditions.